Pet Blog: Pet's Birthdays - Do You Celebrate? What do you do as a family for your special furry and feathered wonders? Comment and share your pet's birthday photos! 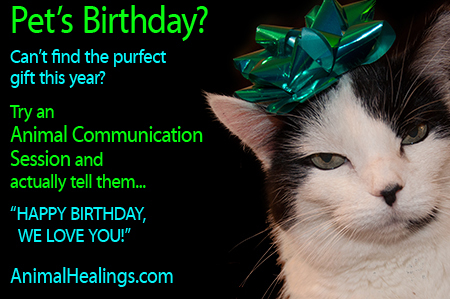 How about an animal communicator session to really tell them "Happy Birthday, We Love You!" And of course you can say and ask so much more! You haven't tried a session before? A pet's birthday would be a wonderful place to start with your special pal. The insight you gain from even one short session will leave you smiling and closer to your pet than ever before. You'll wonder why you didn't do this so much sooner. You can learn about their health, help them with behavior issues (not just problems, but we can explain fears and other things that we can help improve their life.